Superficially the difference may not look like much, but there’s a big difference. The second I saw the marked queen I knew she wasn’t laying, only because I’ve seen non-laying queens before. 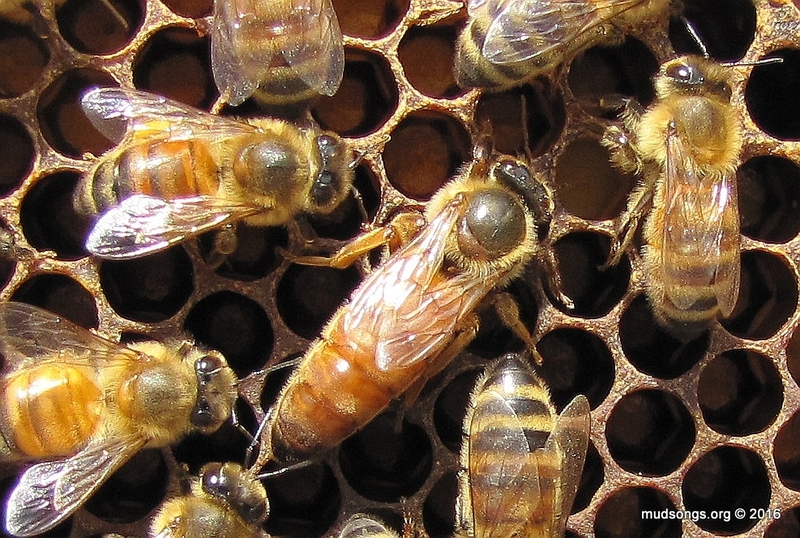 They look short and fat and not much larger than regular worker bees. They’re easy to miss because size-wise, they blend in well with other bees. They are not good layers, if they lay at all. Maybe they don’t have the reach to properly lay an egg at the very centre and bottom of the cells. What’s strange is that this queen didn’t look stubby when I installed her. It’s possible she never got into a laying rhythm and now she’s shut down for the year because it’s cold. Maybe she’ll do fine in the spring. I don’t know. But I do know she’s living in a nuc box where she probably hasn’t laid much of anything at least for a month because other than one or two larvae that are probably drones, there’s no brood on any of the frames and not many bees in what’s left of the cluster either. I may add a frame or two of bees from one of my overflowing hives so they don’t freeze to death going into winter. Then I’ll do what I can to keep her alive in a nuc. But none of this bodes well. I’m also now concerned about the other two surviving mated queens I bought. Are they even alive? Did they shut down early too? Are they going to give out on me over the winter? I don’t know. I guess I’ll have to dig into those hives and find out, just when I thought all my major messing around with the bees was done for the year. This entry was posted in Brood, Broodless, Failing Queens, Mated Queens, Nucs, Queens, Requeening, Year 2016. Bookmark the permalink. That is not a good looking queen. I’m surprised someone even had the gall to sell her to you. I guess you said she was larger when you installed her, but those wings… That just doesn’t look good, but it might be too late for a replacement. Fingers crossed for her (and you). The person who sold me the queens (and gave me this replacement for free) is a good guy. I went to his beeyard and he let me pick the queen from the nuc so I could see what she looked like and how well she was laying. He did that with all the queens I got from him. And as far as both of us could tell, all the queens were good. But most of them didn’t do well once they were introduced to a new hive. Two were killed instantly and superseded. And this queen was superseded but wasn’t killed. I removed the supersedure cells hoping I’d get a virgin queen, etc., but that didn’t work out. So I kept the queen alive, but she’s not doing anything. I’m not convinced I got some bad queens, though. I know at least one of them took off, laying like gangbusters. The second one, I think, is doing okay (but I need to check on it). 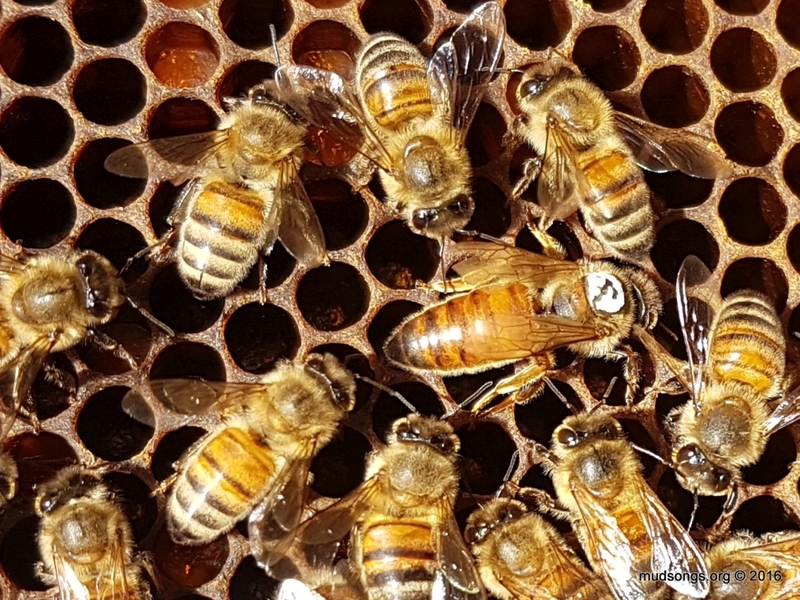 I’ve been reading up a lot on queens in the past few months, and I’ve learned that the introduction of new queens can be extremely complicated, especially if the queen that is being introduced has a genetic make-up that is different than the host hive (do we call it the host hive? I guess so). Dark Russian queens, for instance, are not easily accepted by Italian honey bees because the pheromones of Russian queens are vastly different from Italians. I also spoke to a local beekeeper who is able to travel the world and meet up with some well known beekeepers, and he told me that one trick many of them use to insure the acceptance of an introduced queen is the dip her in water just before installing the queen cage (warm water, I assume). The water apparently cleans off her pheromones, creates a clean slate so to speak, so that the bees in the host hive don’t immediately detect her foreignness. Their first response to her isn’t aggression. It’s nothing. So by the time her pheromones build up to normal strength, the bees have gradually becomes accustomed to her scent and are more likely to accept her. Sounds like a good story, eh? I’ll buy it. I think for now on, I’ll manually release my queens too (if I can). I’ll keep the queen in the cage in the hive for a few days and then come back, and if it looks like they’re not balling the cage, I’ll manually release her. I’ve had too many requeenings go bad. I’ll try anything to improve my record. This queen, however, I think is a goner. I’m not sure if it’s worth the effort to try to keep her alive all winter, but I’ll give it a go. It’ll be a learning experience at least.